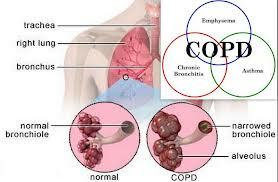 COPD is a respiratory disorder. in which patient feels difficulty in breathing, exhaustion, and apprehension. difficulty in breathing copdAs the name suggests, in this disease there is obstruction in air pathway. the lungs and destroy the air sacs so there will be less surface area available for gaseous exchange and it will lead to quick exhaustion. moreover the dirt and chemicals will cause increase mucous production in air way which causes obstruction or narrowing of air pathway. it will again cause difficulty in breathing.